Sketch! Improv! In-jokes! You’re either in or you’re out. Or you’re part of The Cleek. The most exciting collaboration to come out of Chicago’s Second City Training Center since… well, the last one… Featuring award-winning performers from the UK, US and Australia. The Cleek. Say cheek. In July 2013, Lizzy spent six weeks studying improvisation and sketch comedy at the legendary Second City Training Center, Chicago. She has since teamed up with her classmates to bring a whole new hour of comedy to the Edinburgh Fringe 2014! Follow us on FACEBOOK and TWITTER: WeAreTheCleek for any future performances. 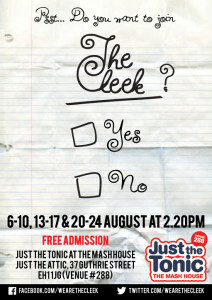 Visit the event page on the Fringe website here!